I don’t actually remember how I first met Renee Robinson. I think it all started when some unmitigated ‘Ho wrote a cruel review about her writing, and I jumped to her defense. That sounds about like me. Anyone who could write cruelly about someone who does what Renee does with her life deserves a smack-down. Of course, I have never met her in person, but I have been corresponding with her for a while. Renee is a Terminal Cancer victim, who just received the dreaded “There is nothing else we can do” message, a message I never received myself, but feared nevertheless. 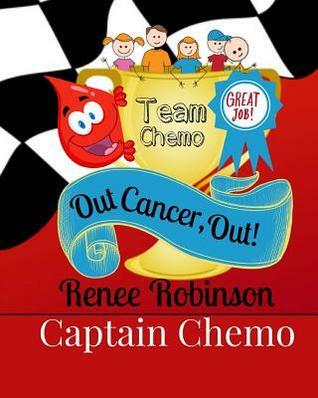 You see, Renee is the author of Captain Chemo: Out Cancer, Out! (Captain Chemo and Team Book 1). It is a poem, a poem designed to help children who are going through chemo to build courage and remain positive through the horrors of chemo. And believe me – chemo is horrendous. The pain, the vomiting, the weakness – it is all more than even adults can sometimes handle. Now, think about a small child going through the same thing – the horror of it all beyond their understanding. Renee’s book helps. Maybe not in any “this is going to make it all go away” sort of way – but it provides hope for the little ones. Renee and her family have donated several of her books to Nationwide Children’s, The James and the Fairfield Medical Center. This book is a perfect donation for the cancer centers in your area. Why not be a peach and purchase several? The children will thank you – and your heart will too. How courageous is it, for someone like Renee who is Terminal, to care so much about children suffering from cancer and try to help them? Renee is someone I am proud to call my friend.